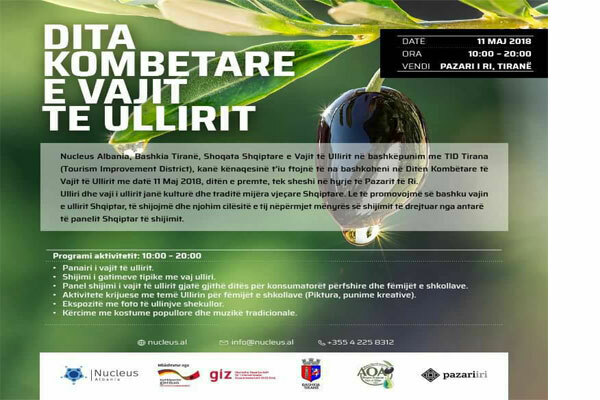 Nucleus Albania, the Municipality of Tirana, the Albanian Association of Olive Oil in cooperation with TID Tirana (Tourism Improvement District) are pleased to invite you to join us on the National Olive Oil Day on May 11, 2018, on Friday, at the entrance of the New Bazaar. Olive and olive oil are culture and tradion in Albania for thousands of years. Let's promote the Albanian olive oil together, know the qualities through the way of tasting led by members of the Albanian tasting panel.